Bibliography: Bartsch 11 (vol. 7, p. 117); Joseph Meder 120 (edition of 1511 with Latin text). Related Works: The DAC set (1944.D1.210.1 – 1944.D1.210.11) is incomplete, lacking Bartsch 5. See DAC 1937.D1.102 for a proof before the Latin text. 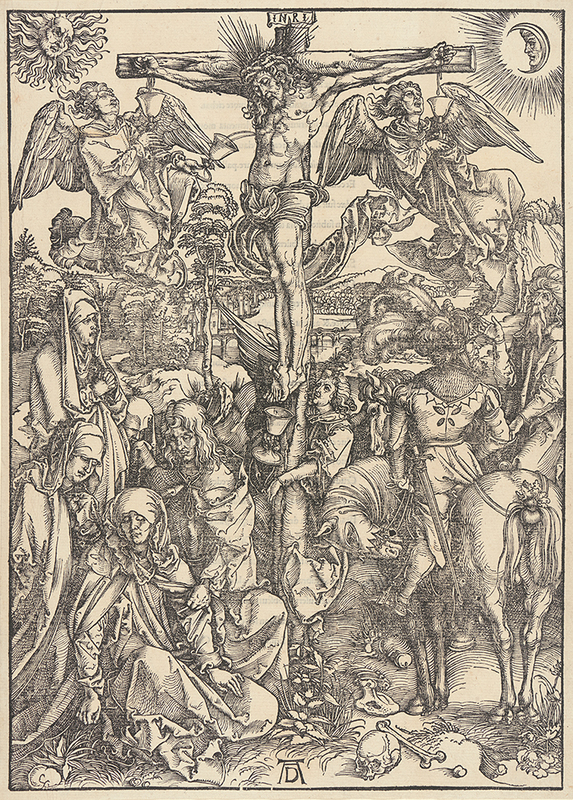 The Crucifixion, . From The Large Passion. Woodcut. DAC accession number 1944.D1.210.7. Gift of George W. Davison (B.A. Wesleyan 1892), 1944. Open Access Image from the Davison Art Center, Wesleyan University (photo: R. Lee). http://dac-collection.wesleyan.edu/obj5132 is a persistent link to this page with no user-session information.